Is flaxseed the new wonder food? Preliminary studies show that it may help fight heart disease, diabetes and breast cancer. Flaxseed is found in all kinds of today's foods from crackers to frozen waffles to oatmeal. The Flax Council estimates close to 300 new flax-based products were launched in the U.S. and Canada in 2010 alone. Not only has consumer demand for flaxseed grown, agricultural use has also increased. Flaxseed is what's used to feed all those chickens that are laying eggs with higher levels of omega-3 fatty acids. Eating flaxseed daily may also help your cholesterol levels. The level of LDL or "bad" cholesterol in the bloodstream has been linked to an increased risk of heart disease, obesity, diabetes, and metabolic syndrome. A study of menopausal women showed a decrease in LDL level after the women ate 4 tablespoons of ground flaxseed each day for a year. Fitzpatrick says the cholesterol-lowering effects of flaxseed are the result of the combined benefits of the omega-3 ALA, fiber, and lignans. Two components in flaxseed, ALA and lignans, may reduce the inflammation that accompanies certain illnesses (such as Parkinson's disease and asthma) by helping block the release of certain pro-inflammatory agents, Fitzpatrick says. It's tempting to think of flaxseed as a super food because of its many potential health benefits. But keep in mind there is no magic food or nutrient that guarantees improved health. Until more is known, Thompson says, pregnant women and possibly breastfeeding mothers should not supplement their diets with ground flaxseed. "Our own animal studies showed that flaxseed exposure during these stages may be protective against breast cancer in the offspring. But a study of another investigator showed the opposite effect," Thompson says. Thompson says, "Ground flaxseed, in general, is a great first choice, but there may be specific situations where flax oil or the lignans (taken in amounts naturally found in flaxseed) might be as good." 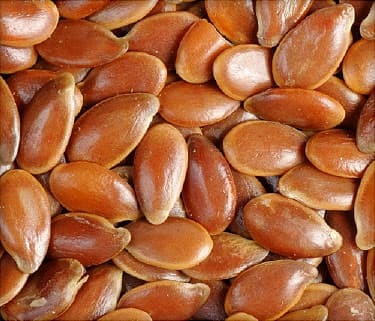 How much flaxseed do you need? The optimum dose to obtain health benefits is not yet known. But 1 to 2 tablespoons of ground flaxseed a day is currently the suggested dose, according to the Flax Council of Canada. Find it in stores or on the Internet. Many supermarket chains now carry ground flaxseed (or flax meal). It’s usually in the flour or "grain" aisle or the whole-grain cereal section and is often sold in 1-pound bags. You can also find it in health food stores or order it on various web sites. Hide flaxseed in dark, moist dishes. The dishes that hide flaxseed the best are dark sauces or meat mixtures. No one tends to notice flaxseed when it's stirred into enchilada casserole, chicken parmesan, chili, beef stew, meatloaf, or meatballs. For a 4-serving casserole, you can usually get away with adding 2 to 4 tablespoons of ground flaxseed. For a dish serving 6 to 8, use 4 to 8 tablespoons. In medium bowl, whisk together flours, baking powder, baking soda, salt, and flaxseed. Add flaxseed mixture to sour cream mixture, beating on low speed just until combined (batter will be a little lumpy). Spoon batter by 1/4 cupful into prepared muffin pan. Lilian Thompson, PhD, professor emeritus, department of nutrition sciences, faculty of medicine, University of Toronto. Floyd Chilton, PhD, director, Wake Forest & Brigham and Women’s Center for Botanical Lipids. Kelley C. Fitzpatrick, MSc, director of health and nutrition, Flax Council of Canada. Jim Hammond, PhD, professor, AES Plant Sciences, North Dakota State University. Flax Council of Canada web site: "The U.S. Market for Flax Ingredients and Competitive Products," 2006. Flax Council of Canada web site: "An Ancient Crop." Liou, Y. Journal of Nutrition, April 2007. Williams, D. Food and Chemical Toxicology, 2007. Jungestrom, M. Clinical Cancer Research, 2007. Pan, A. PloS One, 2007. Ander, B.P. Cardiovascular Research, 2007. Williams, C. Proceedings of the Nutrition Society, February 2006. Pruthi, S. Journal of the Society for Integrative Oncology, 2007. Chilton, F. American Journal of Clinical Nutrition, February 2008. Connor, W. American Journal of Clinical Nutrition, January 2000. Mozaffarian, D. Alternative Therapies in Health and Medicine, May 2005. Zhao, G. American Journal of Clinical Nutrition, February 2007. Brighenti, F. British Journal of Nutrition, May 2005. Young, I. Journal of Clinical Pathology, 2001. American Society of Clinical Oncology's annual meeting, Chicago, June 3-7 2011. Elaine Magee, The Flax Cookbook: Recipes and Strategies for Getting the Most from The Most Powerful Plant on the Planet, Da Capo Press, 2002.